My day began early. I am sitting in a waiting room anticipating my nephew's turn to have his tonsils yanked out. Well, lasered out or off or whatever they do to tonsils these days. Did I say I got up early? It was early. Very. I am not ready to people. Still. My mom is behind me making small talk with the Church Lady she was surprised to see today. They're getting along pleasantly, and I hope it continues. I'm letting them go on without me. No one remembers the martyr groundhog who gets between the land mine and the tank. Small talk is horrible. Tragic even. I appreciate its place in society, but it does not appreciate mine. As I'm accidentally on purpose avoiding chit-chat with Church Lady and my mom, there go the strangers to my right. Talking to me. Right to my face, like I'm a person or something. Shoes. They like my shoes. "They're nice," says the man with the diamond earrings and delicate glasses. "They got colors on them. I like all them colors." "Thanks," I say back with what I hope is a shy, distracted, I-want-to-go-back to my writing smile. "They sure do got lots of colors on them," he says first to me and then to his friend, who has on boots in a singular, apparently boring brown. He glances at them, too. "They do!" exclaims Brown Shoes. Envious? Appalled? My shoes are not brown. Not even at all. "What are those?" she asks. "Oh, okay, but like, what kind?" I clear my throat and do the smile thing. "Um, running shoes, I think. You can run in them if you're not me." Somehow from there, the talk turned to casinos. I'm not sure exactly how that happened except maybe they don't like small talk either. Eventually, they call my nephew back. I miss him. I like talking to him. I like not talking to him. I just like him. My mom and sister go back with him, leaving me with Church Lady. Church Lady is nice, and also a genius. She loves my nephew, so she passes the first test. She asks me to run to McDonalds with her to grab some breakfast. There, she showed me magic. Magic! Putting mustard on a sausage biscuit is not only not gross, it is delicious AND it cuts the greasy taste of fast food "sausage." This is magical in itself, but also because it will enable me to intake more unnecessary, unhealthy calories without tthat pesky nasty greasy excuse not to. Of course, this means all future weight gain will be blamed on Church Lady. It's okay though. She had to have seen this coming when she handed me the mustard. The waiting room hasn't changed in our absence. It is still full of glaze-eyed people staring at the floor. One of them kind of looks like the tuba player from my old brass quintet, but if he was a little older and stuffed. I wonder for a moment if that might be the case, that this guy was stuffed and planted in the waiting room like a scarecrow, but then he moves. A flinch first, a twitchy muscle spasm. This is involuntary, his body says to me, the quiet people-watcher Roger-lite doesn't see. Then, slowly, he turns his head and accidentally watches HGTV. Accidentally, I'm sure. I scan the room for other brass quintet doppelgangers, but everyone seems to have his or her own unique face. Well, there's one guy who kind of looks like Joe Biden, but that is a bit of a stretch. I'm cold. 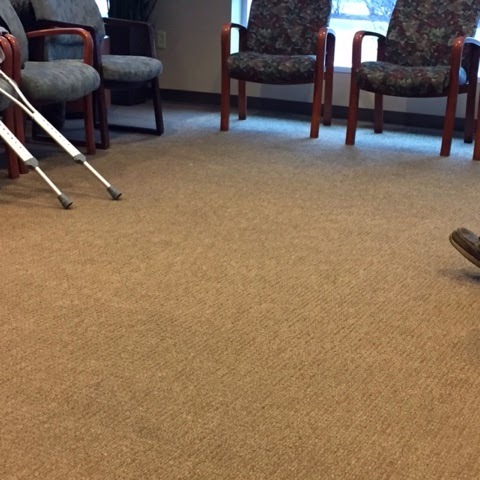 I am pretty sure they do that to waiting rooms on purpose. Don't get too comfortable, buster. Leave your coat right where it is. You see, unless you're a writer, waiting is boring. Bored people tend to sleep. Sleeping people snore. Snoring people are murdereed by bored, non-sleeping waiters. Obviously, whomever set the thermostat is in the life-saving business and I had better just get used to it. A man's phone rings. Duelling Banjos. It's his daughter. Munchkin is good. So is Matt. Her mother is in good spirits, but he's kind of tired. Daughter told him yesterday that she's a pro at this, having surgery. She says for him to text her. He says he can't. She says he can if he tries. He doesn't want to try. He heard something about a drug bust down on the four-lane highway. He hopes they got every one of them. It's a shame they didn't shoot them. "I know, Dad," says the daughter. She knows. I know, too because he is talking to her on speakerphone. I wonder if he has a hearing problem, but he doesn't. My mom is back and they are now best friends forever. They're talking about butchering hogs. He hears her fine. So do I. It's time to go to the restroom. 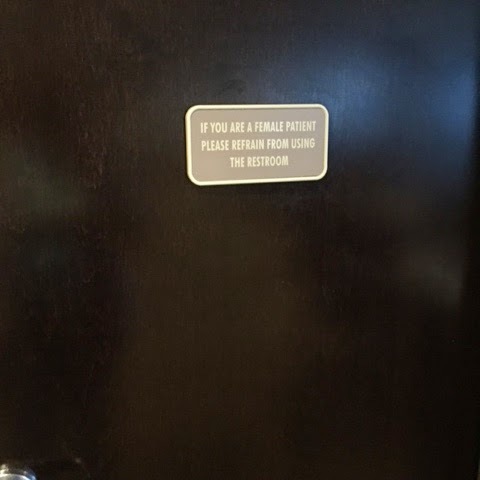 There is a sign on the door warning female patients not to use the restroom. Why? WHY? Reasons, that's why. Men patients, go right on ahead. Standing up, even. They need to hurry up perfecting my already near-flawless nephew and return him to me fast. Soon, he will have no good-willed aunt to tickle fight with and from whom to learn the art of sarcasm. He will have a husk that looks like me, a remnant of the waiting room sacrifice made on the altar of cheap coffee by the light of a mop commercial. At least I can go to the restroom anytime I want and my shoes are cute. They have colors.